The Wil liam and Nancy Budd Scholarship Fund provides scholarships for secondary school and university students in Kenya. It finances full tuition for Forms 2, 3 and 4 (grades 10-12) and a significant portion of university-level tuition. Students are selected without regard to ethnic origin, gender or religious affiliation. The William B. Budd Scholarship Fund was created in 2000 by Daniel Ritchie to honor the memory of his stepbrother William B. Budd who died in 1999. Daniel was a Peace Corps Volunteer in western Kenya, not far from the Kinyoro Primary School near Kitale. Bill Budd was in the investment management business in Boston and New York for his entire career. He loved life, learning and young people. 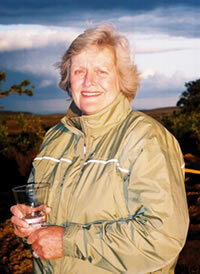 Nancy Budd, the former Vice President of the William B. Budd Scholarship Fund, passed away in December 2007. Nancy was beloved by the scholarship students, many of whom wrote to her when her cancer recurred in 2005. She made three visits to Kenya, in 2001, 2003 and 2005, to meet the students and visit their schools. She described to them her own experiences as a scholarship student. The photo above was taken during her trip to Kenya in January 2005. The Fund has been renamed the William and Nancy Budd Scholarship Fund to honor both Bill and Nancy.